Over the past 20 years, The DSA Department of Dance and Movement has developed and refined a nationally recognized 7-year comprehensive and developmental curriculum that balances technical proficiency with creative integrity. 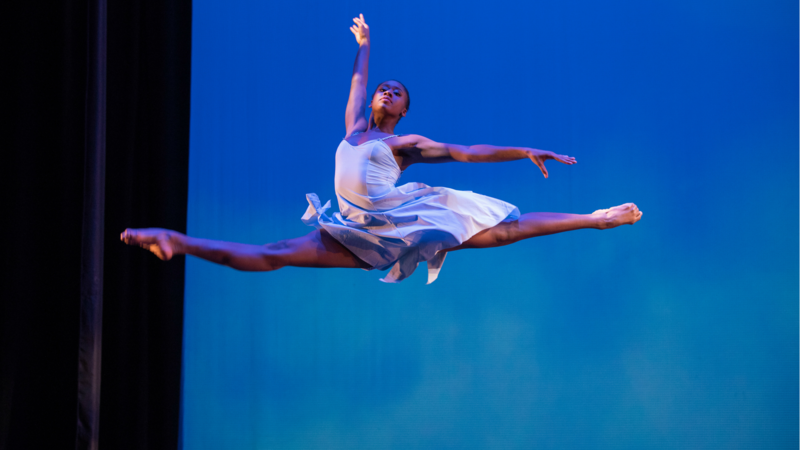 By training dancers in both the physical demands of classical and contemporary technique and the artistic expression of the choreographic act, DSA graduates are well prepared for continued success in the professional field and the rigorous demands of a university BFA degree program. Although the level of technical ability varies from student to student, the advantages of placing the student with age level peers generally outweighs the practice of placing highly trained students in more advanced classes based solely on their technical abilities. These are young artists that must develop social skills as well as artistic skills. It is with the conscious and methodical rising up through the levels that a dancer or group of dancers finds their technical base and creative motivations to become movement artists. It is through the bonds that develop in these safe group interactions that the young dancer finds the “stuff” of which meaningful dances are created- namely the experience of life and love and a dancer’s relationship to life and love in all its forms. The Beginning Class (Grades 6 & 7) emphasizes Levels I and II fundamental technique in modern, ballet, jazz and cultural dance forms. Improvisation is taught and beginning choreographic concepts, as well as, collaboration processes are introduced through teacher driven group compositions. 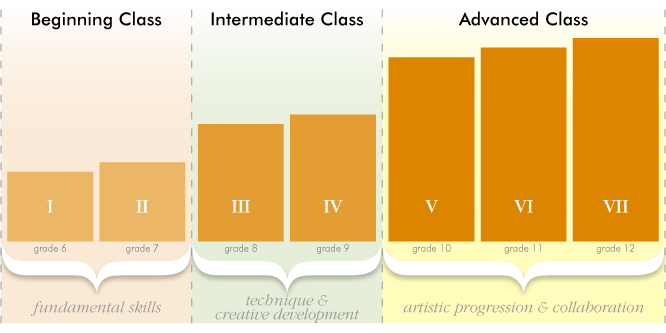 The beginning level class is made up of the incoming 6th and 7th grade students and 2nd year 7th grade students. Many of the dance element explorations and choreographic lessons are new to 6th grade students. Second year students are encouraged to act as leaders by modeling their understanding of the dance elements and collaboration skills developed during their first year. Being nurtured as artists and members of a community, students are given the fundamental insights into the nature of dance as an art form that expresses the human experience in literal, cultural and abstract forms. It is during the two years in the Beginning Class that young artists learn and express the respect for the training process offered at DSA. Opportunities to learn the art of collaboration and compromise will be ongoing. Assistance in finding the balance between the wants of the individual and the needs of the group are given by the instructors in the form of conflict resolution techniques and reinforcement of compassion and understanding of our diverse community. There is no greater learning that can take place at the beginning of a 7-year training process than the development of love and respect for each other through celebration of our unique individuality and a diminishing of the fear of those who are different from us. In the Intermediate Class (Grades 8 & 9), there is a continuation of technical development in Levels III and IV ballet and modern dance with an added emphasis on jazz, tap and partnering. By grouping the 8th and 9th grades together, a seamless transition from middle school to high school is achieved, thus moving 8th graders into an exciting realm of maturation in their training and creativity. Through exploration of weight bearing, cantilever, and “using the bones” as central support, students are introduced to the fundamentals of partnering which are used in the group dance composition. These choreographic works continue to strengthen collaboration, communication and cooperation. 9th graders are expected to model good leadership as the 8th graders explore these partnering concepts for the first time. Solo composition is explored with spoken word in the 8th grade and integration of dance theory based on Rudolph Laban’s “Effort” theory is introduce in the 9th grade. For the majority of young people, the 8th and 9th grade is the time of the greatest change physiologically and emotionally as their bodies and minds undergo the transition of puberty. By giving students a safe and structured introduction to the elements of partnering, they are invited to negotiate within themselves and interpersonally, the dynamics of touch, strength and weight sharing. This helps reduce the social stigmas attached to physical contact by creating a healthy artistic environment within which to explore and create together. The Advanced Class (Grades 10, 11, & 12) emphasizes individual choreographic projects and work with professional guest choreographers through an elegant 3-year movement through the program’s finishing Levels V, VI, and VII. The Advanced Class is primarily returning 10th, 11th and 12th grade high school students and on rare occasion, an exceptional incoming high school student with extensive dance experience. Students in the Advanced Class are challenged to increase the depth of their technical training as they prepare for university level dance or the professional field. Throughout the year, Advanced Class dancers are engaged in university and professional level expectations through residencies with college dance professors, professional choreographic repertoire, and college recruitment and audition classes. DSA has hosted master classes and auditions with instructors from California Institute of the Arts, Cornish College, New York University, Adelphi University, Virginia Commonwealth University, University of Southern California, Southern Methodist University, University of Wyoming and Colorado State University. Professional repertoire has included the work of Larry Keigwin, Hannah Kahn, David Taylor, Maureen Breeze, David Reuille, Cleo Parker Robinson, and Martha Graham. Master classes have included the companies of Paul Taylor, Jose Limon, Mark Morris, Robert Moses, Meryl Tankard, Momix, Ballet Folklorico, Trey MacIntyre Project, and The Ballet Trocadero de Monte Carlo. By grouping the 10th, 11th and 12th grades together, DSA dance majors are given a 3-year refining of their technical and creative artistry, functioning as a cohesive unit with shared goals. Participating in a culture of cooperation over these 3 years allows for a collective and unified structuring of known expectations and successful leadership for the graduating class. This also allows for a large enough group of dancers to fulfill the curricular choreographic assignments including Junior and Senior Projects where all advanced level students are involved in collaborative process of increasing levels of personal responsibility and creativity. Culminating with the Senior Dance Projects, where the senior class choreographs their work on the sophomores and juniors, the graduating class is afforded a leadership and artistic opportunity that mirrors that of a collegiate BFA final project. It is in this rigorous collaborative process that the 7-year development of choreographic skills and vision is brought to full fruition.